﻿ Crude Extracts of Senna alata (L.) Roxb. Mimics Plant Growth Hormones in Promotion of Vegetative and Reproductive Growth in Celosia argentea L.
The efficacy of crude extracts of Senna alata in the improvement of vegetative and reproductive growth in Celosia aregentea was investigated. Fresh leaves of S. alata were blended with a homogenizer in 1 litre of distilled water. The resultant green paste was filtered under suction. Different concentrations (75%, 50%, 40%, 30%, 25%, 12%, 10%, and 5%) were prepared from the 100% crude extract. Seeds of C. argentea were presoaked in these different concentrations including a control (0%) and planted out after 24 hours. Results obtained showed that seedling height, leaf area, dry weight and leaf area ratio were promoted and enhanced by presoaking seeds in the extract. At the end of the experimental period (six weeks), seedling height in 75% and 100% treatments were 109 ± 16.12 cm and 117 ± 19.32 cm, leaf area 128 ± 17.91 cm2 and 125 ± 18.12 cm2, dry weight 7.48 kg and 7.0 kg respectively. Seedlings raised from seeds presoaked in water (control) however, flowered earlier (8 weeks) than the treatments (10 weeks in 75% and 100%). Presoaking seeds of C. argentea in crude extracts of S. alata before planting is recommended for optimum production of the leafy vegetable. The procedure is cheap and easily implementable by resource- poor farmers who are the main growers of C. argentea. The genus Celosia (Amaranthaceae) is represented in Nigeria by six species, which have been described   . Celosia argentea, one of the species of Celosia, is among the important leafy vegetables in Nigeria. While Law-Ogbomo and Ekunwe  reported that the leaves and young shoots, which contain high levels of calcium, phosphorus and iron, are used in soups and stews, . Akinyemi and Tijani-Eniola  noted that the plant is an important source of proteins, calories, vitamins and minerals. Other information concerning the edibility of the leaves and stems of the species in soups, stews either single or in admixture with other food items like rice, maize, yam and cassava are aboundabundant   . Due to the nutritional qualities of the species (protein 4.7 g, fat 0.7 g, carbohydrate, 7.3 g, fiber 1.8 g, water 83.8 g, calcium, 260 mg, phosphorous 43 mg, iron 7.8 mg) as estimated per 100 g of edible portion  , it has been stated that “Celosia has high potentials for reducing malnutrition which is rampant in Nigeria”  . C. argentea is also a plant of great medicinal value. Bélanger et al. reported lute in and β-carotene (both carotenoids) in fresh samples of C. argentea. Both substances play important roles in maintenance of eye health. Other documented medicinal uses of the plant include use of seeds for the treatment of diarrhea, dysentery and muscle difficulties   , flowers for the treatment of dysentery, haemoptysis and menstruation problems  and roots for treatment of chronic eczema and gonorrhea  . A major advantage of C. argentea as a leafy vegetable is its cheapness wherever it is grown in Nigeria. Thus, whenever available, it is usually affordable to the rural poor. Despite the importance of this leafy vegetable, recent researchers have identified poor soil conditions resulting from continuous cultivation  and obsolete cultural practices employed in its production, such as low plant density and non-use of manure/fertilizer input among others  , as limiting the production of the crop. Therefore These these have therefore advocated improvement through use of both organic and inorganic manure/fertilizer. Crude extracts from several plants are known to have antibacterial, antifungal, and other ethnomedicinal uses  -  . Few investigations into the inhibitory effects of crude extracts from plants on germination, growth and development of other plants include the works of Tsao et al. , which showed phytotoxicity of Ailanthus altissima extract on Medicago sativa and Roy et al. that showcased the inhibitory effects of crude extracts from banana on lettuce, red amaranth, amaranth, radish, cucumber, ribbed gourd, bean and okra. On the other hand, earliness in flowering and other reproductive growth have been in Arachis hypogea and Vigna unguiculata by treating seedlings of these species with water extracts of Senna alata  . Agbagwa et al. investigated the efficacy of spraying seedlings of C. argentea with crude extracts of S. alata and recorded tremendous success ranging from promotion of germination, vegetative and reproductive growth. Efforts to increase the yield of this vegetable by application of organic and inorganic manure have been noted earlier. Against this background, this research further aims at providing economically sustainable means of improving the cultivation of C. argentea and by implication other vegetable crops. Seeds of C. argentea sourced from a home garden at Orji, Owerri Imo State (5˚31'9''N, 7˚3'50''E) and leaves of S. alata collected from the wild along University of Port Harcourt Teaching Hospital Road (4˚88'78''N, 6˚92' 68''E), were used for this study. Samples of both plants were taken for taxonomic authentication at the University of Port Harcourt Herbarium (UPH). 300 g of the fresh leaves of S. alata were weighed out on top loading balance (Model Mettler/Toledo AE 163) and blended with a homogenizer (laboratory blender) in 1 litre of distilled water. The 5-speed homogenizer was set at 100 rpm at 27˚C and operated until the leaf samples were crushed into fine paste. The green paste so obtained was filtered under suction (850 air compressor, 54750 FBF ). The filtrate, which was regarded as 100% crude water extract, was stored in the refrigerator at 4˚C until required. From this stock concentration, lower concentrations of 75%, 50%, 40%, 30%, 25%, 12%, 10%, and 5% were prepared. Nine batches of C. argentea seeds with each batch containing 40 seeds were presoaked in 8 × 50 ml beakers for 24 hours; each beaker contained a concentration (i.e. 5%, 10%, 12.5%, 25%, 30%, 40%, 50%, 75% and 100%) of the crude water extract. A control with 0% (distilled water 0 was set up. After the 24 hours presoaking of seeds, the seeds were planted according to their concentrations in plastic buckets filled with top soil from the garden. The frequency of plumule emergence was noted. The plant heights, leaf area, leaf area ratio, dry weight, relative growth rate (RGR) and net assimilation rate (NAR) were recorded at weekly intervals. A similar arrangement with six batches of 40 C. argentea seeds each were presoaked in different concentration of the S. alata basic extract (10%, 30%, 50%, 75% and 100%) for 24 hours. A control was also set up in distilled water. Similar measurements/readings as above were taken. All results were subjected to statistical test using modified t-test method for the comparison of means  . where dw refers to change in whole plant dry weight dt refers to change in time. where is reciprocal of area of leaf. dt refers to time change. Figure 1. Effects of presoaking C. argentea seeds in S. alata crude extract on height. 5% (89 ± 1.73 cm) and 10% (86 ± 4.70 cm) crude extract were slightly less than that of the control (91 ± 1.50 cm) within the same period. The height of seedlings in the various treatments followed a pattern of increase from lower to higher concentrations, with seedlings raised from seeds presoaked in 100% of the crude extract showing the highest heights (117 ± 19.32 at the sixth week) for all the weeks. Significant promotory effect on leaflet enlargement of C. argentea seedlings was recorded with all the treatments when compared with the control (Figure 2). Leaf area of seedlings raised from 5% crude extract pretreated seeds (102 ± 1.59 cm at six weeks) was however, slightly lower than that of the control (104 ± 1.40) throughout the period of investigation. Those raised from 12.5% crude extract pretreated seeds were less than the control at the second week, but gradually increased above the control from the third week. These results generally agree with earlier observations, which reported improved height and leaf area in plants treated with crude extracts of S. alata  -   . Like the height of seedlings, the leaf area of seedlings pretreated with the crude extract (except in seedlings pretreated with 75% of the crude extract) were observed to increase from lower to higher concentrations. 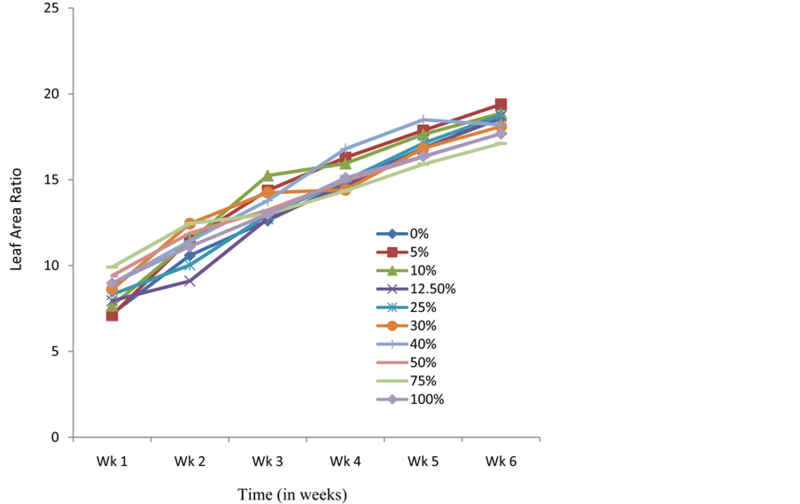 The average leaf area of seedlings from the 75% treatment was however, more than those of 100% treatment from the second week to the end of the study. Presoaking seeds of C. argentea in crude extracts of S. alata also resulted in C. argentea seedlings whose average dry weight and LAR were higher than the control at the end of the experimental period (Figure 3 and Figure 4). Results obtained with the Relative Growth Rate (RGR-a measure used to quantify the speed of plant growth) and Net Assimilation Rate (NAR-mean rate of dry matter production per unit of leaf area) for the different treatments did not follow any specific pattern or trend (Figure 5 and Figure 6). However, the NAR were generally high within the first one week and tended to decrease from thence thereafter (Figure 6). 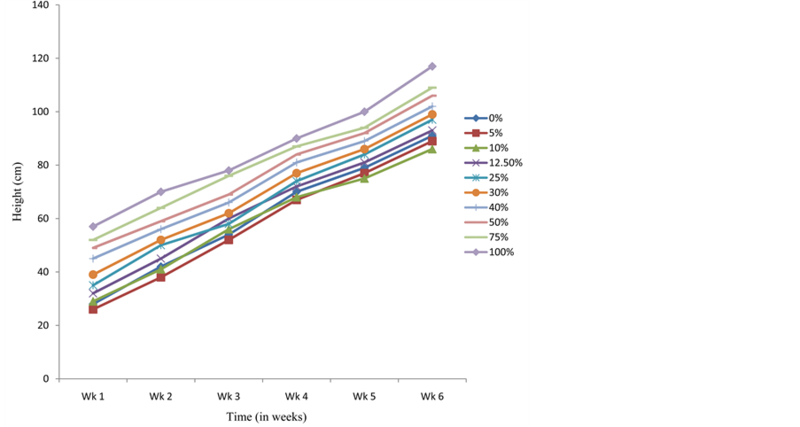 The sharp increase in RGR at week 3 and sudden drop at week 4 for seedlings presoaked in 100% of the extract (Figure 5), is noteworthy. This abnormal drift, which is not presently understood, is being further investigated. Seedlings of C. argentea grown from seeds pretreated with S. alata water leaf extract were observed to flower later than the control. Seedlings grown from 40% presoaked seeds flowered in 67 days (or 9½ weeks), while 75% and 100% treatments flowered approximately 10 weeks after sowing. The control plants flowered in 8 weeks. Those grown from 10% flowered after 9 weeks of sowing. Figure 2. Effects of presoaking C. argentea seeds in S. alata crude extract on leaf enlargement. Figure 3. Effects of presoaking C. argentea seeds in S. alata crude extract on dry weight. Figure 4. Effects of presoaking C. argentea seeds in S. alata crude extract on Leaf Area Ratio. grape plants by exogenous treatment with crude extracts of a marine plant, Ascophyllum nodosum  . So also did Chowdhury et al. observe improved quality and yield of Mangifera indica (mango) treated with plant extracts. These results generally show that crude extracts from some plant species promote growth and development in other plants. Though some recent studies have shown inhibitory effects of crude extracts from plants on germination, growth and development of other plants    , the promotion of plant growth and development by crude extracts of S. alata is unequivocally established by this study. The study also confirms previous findings  -   on the efficacy of crude extracts of S. alata in promoting plant growth and development, a, feat performed by plant hormones. The crude extract of S. alata therefore contains plant growth promoting substances, which mimics plant hormones sensu stricto. Figure 5. Effects of presoaking C. argentea seeds in S. alata crude extract on Relative Growth Rate. Figure 6. Effects of presoaking C. argentea seeds in S. alata crude extract on Net Assimilation Ratio. Since exogenous treatment of C. argentea seeds with crude extracts of S. alata resulted in increase in height and leaf area of experimental seedlings over the control within the study period, the use of this extract is advocated for C. argentea and other vegetables. Presoaking in crude extracts of 50%, 75% and 100% concentrations are most recommended as they produced the best of leaflet enlargement. This will enhance production of this important vegetable plant, whose nutritional quality estimated per 100 g of edible portion was put as protein 4.7 g, fat 0.7 g, carbohydrate, 7.3 g, fiber 1.8 g, water 83.8 g, calcium, 260 mg, phosphorous 43 mg, iron 7.8 mg  . It is worthy to note that the procedure involved in the extraction of the crude extract from the leaves of S. alata is simple, practicable with easy and cheap to fabricate equipment. The procedure can be easily be transferred to resource-poor farmers, who are the main growers of this it and most other vegetable plants. Hutchinson, J. and Dalziel, J.M. (1954) Flora of West Tropical Africa. Vol. 1, Crown Agents for Oversea Governments and Administrations, London, 145-147. Law-Ogbomo, K.E. and Ekunwe, P.A. (2011) Growth and Herbage Yield of Celosia argenteaas Influenced by Plant Density and NPK Fertilization in Degraded Ultisol. Tropical and Subtropical Agroecosystems, 14, 251-260. Akinyemi, S.O.S. and Tijani-Eniola, H. (1997) Effects of Cassava Density on Productivity of Plantain and Cassava Intercropping System. Fruits, 50, 17-23. Tindall, H.D. (1983) Vegetables in the Tropics. Macmillan Press Limited, London, 37-45. Grubbenand, G.J.H. and Denton, O.A. (2004) Plant Resources of Tropical Africa 2 (Vegetables). PROTA Foundation, Wageningen, 167-173. Leung, T.W., Busson, F. and Jardin, C. (1968) Food Composition Table for Use in Africa. FAO, Rome, 306. Adeyeye, A.S., Ogunwale, O.A. and Mofikoya, F.A. (2013) Growth, Dry Matter Accumulation and Shoot Yield of Celosia argenteaas Affected by Poultry Manure and Urea Application. International Journal of Agricultural Policy and Research, 1, 210-215. Bélanger, J., Balakrishna, M., Latha, P., Katumalla, S. and Johns, T. (2010) Contribution of Selected Wild and Cultivated Leafy Vegetables from South India to Lutein and β-Carotene Intake. Asia Pacific Journal of Clinical Nutrition, 19, 417-424. Budin, J.T., Breene, W.M. and Putnam, D.H. (1996) Some Compositional Properties of Seeds and Oils of Eight Amaranthus Species. Journal of the American Oil Chemists’ Society, 73, 475-481. Chweyaand, J.A. and Eyzaguirre, P.B. (1999) The Biodiversity of Traditional Leafy Vegetables. International Plant Genetic Resources Institute (IPGRI), Rome, 15-45. Owoyale, J.A., Olatunji, G.A. and Oguntoye, S.O. (2005) Antifungal and Antibacterial Activities of an Alcoholic Extract of Sennaalata Leaves. Journal of Applied Science and Environmental Management, 9, 105-107. Olowosuluand, A.K. and Ibrahim, Y.K.E. (2006) Studies on the Antimicrobial Screening of Aqueous Extracts of Five Plants Used in Folk Medicine in Nigeria. West African Journal of Biological Science, 3, 21-26. Elmahmood, A.M. and Amey, J.M. (2007) In Vitro Antibacterial Activity of Parkiabiglobosa (Jacq) Root Bark Extract against Some Microorganisms Associated with Urinary Infections. African Journal of Biotechnology, 6, 1272-1275. Faruq, Z.U., Rahman, U.A., Bello, M., Obianke, M. and Atiku, F.A. (2010) Antibacterial Activity of the Active Component of Cassia alata Leaves. Nigerian Journal of Basic and Applied Science, 18, 97-100. Ogunjobi, A.A. and Abiala, M.A. (2013) Antimicrobial Activity of Senna alata and Phyllanthus amarus. Global Jour- nal of Pharmacology, 7, 198-202. Roy, J., Shakaya, D.M., Callery, P.S. and Thomas, J.G. (2006) Chemical Constituents and Antimicrobial Activity of a Traditional Herbal Medicine Containing Garlic and Black Cumen. African Journal of Traditional Medicine, 3, 1-7. Onofeghara, F.A. (1981) Botany in Human Affairs. Inaugural Lectures Series Number 3, University of Port-Harcourt, Port Harcourt. Agbagwa, I.O., Onofeghara, F.A. and Akonye, L.A. (2002) Effects of the Basic and Acidic Leaf Extracts of Senna alata (L.) Roxb. on the Growth and Flowering of Celosia argentea L. Journal of Agriculture, Biotechnology and Environment, 4, 6-10. Agbagwa, I.O., Onofeghara, F.A. and Mensah, S.I. (2003) Stimulation of Growth and Development of Celosia argentea L. by Crude Extracts of Senna alata (L.) Roxb. Journal of Applied Science and Environmental Management, 7, 9- 13. Ukwuije, R.P.I. (1994) Peanuts Educational Statistics. Laser Engineering Consultants, Port Harcourt. Onofeghara, F.A. (1981) The Effects of Growth Substances on the Flowering and Fruiting of Lycopersicum esculentum and Vigna unguiculata. Phytologist, 40, 107-116. Davenport, T.L., Pearce, D.W. and Rood, S.B. (2001) Correlation of Endogenous Gibberellic Acid with Initiation of Mango Shoot Growth. Journal of Plant Growth and Regulation, 20, 308-315. Dokoozlian, N.K. (2001) Gibberellic Acid Applied at Bloom Reduces Fruit Set and Improves Size of “Crimson Seedless” Table Grapes. HortScience, 364, 706-709. Mensah, S.I. and Agbagwa, I.O. (2004) Breaking Dormancy in Gmelina arborea Roxb. through Treatment of Seeds with Chemical Substances and Alternating Temperature. Journal of Biological Research and Biotechnology, 2, 59-66. Nwalozie, M.C. (1984) The Effects of Cassia alata Leaf Extracts on the Germination, Growth and Flowering of Vigna unguiculata, Arachis hypogea and Sorghum bicolor. M.Sc. Thesis, University of Port-Harcourt, Port Harcourt. Norrie, J. and Keathley, J.P. (2006) Benefits of Ascophyllum nodosum Marineplant Extract Applications to Thompson Seedless Grape Production. ISHS Acta Horticiturea, 71, 22-28. Chowdhury, M.N.A., Rahim, M.A., Khalequzzaman, K.M., Humavan, M.R. and Alam, M.M. (2007) Effect of Plant Extracts and Time of Application on Incidence of Anthracnose, Yield and Quality of Mango. International Journal of Sustainable Crop Production, 2, 59-68. Osuagwu, G.G.E. and Ibeabuchi, I.C. (2010) The Influence of Aqueous Leaf and Stem Extracts of Adenialobata (Jacq) on the Flowering and Fruiting of Okra (Abelmischus esculenta) and Groundnut (Arachis hypogea). African Journal of Biotechnology, 9, 3260-3263.